The AKCP base units work standalone or can be used with AKCess Pro Server. All sensors include an integrated data collection and graphing package; especially useful in trend and information analysis. For example, spotWater Sensors can be used to detect water leaks from CRAC systems. Smoke Detectors can be used to detect the initial signs of component fires in data cabinets. An essential part of any computer room monitoring system is accurate temperature and humidity monitoring and knowing when CRAC units are on or offline. Rising temperatures lead to system failure, unwanted downtime and costly repairs. AKCP’s equipment helps to avoid these costly errors with easy to configure, cost effective systems that are ready to run, right out of the box. Up to 12 AKCP Sensors can be graphed on an AKCP base unit. 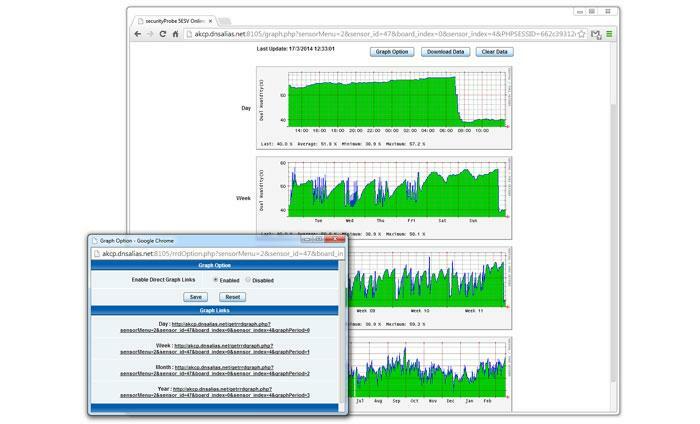 The AKCess Pro Server allows for an unlimited number of graphs to be monitored. * Price shown reflects a quantity 1 and includes the SP2, Temperature / Humidity and Air Flow Sensor. * Price does not include PoE Option. * Price shown reflects a quantity 1 and includes the SP8, Siren Strobe, Motion Detector, securitySensor and Smoke Detector.